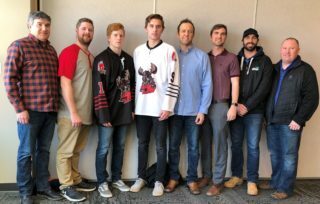 (Marc Smith/DiscoverMooseJaw) With a week to let the loss sink in, the Moose Jaw Warriors are now trying to learn from their second round playoff exit as they head into the offseason. The Warriors lost out in seven games to the Swift Current Broncos for the second straight season last Monday. 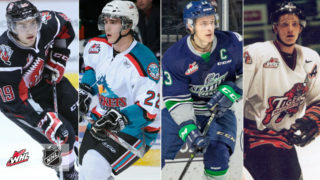 A large part of this year’s team will be moving on from the Western Hockey League, but some key players will be returning next season and they’re hoping to use the experience as a lesson. “There’s obviously disappointment, we built this year up to go deep in the playoffs and we lost in the second round in Game 7, but we know what we could have done better and what we need to work on going into next season to make it better,” said forward Justin Almeida. The Warriors set franchise records in the regular season, but wore out as the playoffs went on after playing back-to-back seven-game series. Defenceman Josh Brook said it will take a while for the team to get over their Game 7 loss, “I can’t feel good about that season, I feel like its unfinished and it shouldn’t be over yet,” he said. Fellow defenceman Jett Woo added, “Going into next year, we’re going to have to play playoff hockey the whole year and get into that mindset right away,” he said. Remembering what it feels like to come up short is the big thing that all the players said they were going to take away from the playoff loss. It was a stinging loss after winning the regular season title. “There’s lots of things to evaluate from that (loss), there’s lots of reasons why we didn’t get it done and part of the process of everybody making themselves better is a proper evaluation and making sure we’re better as we move forward in all areas of hockey operations department,” said Warriors general manager Alan Millar. Big pieces from this year’s Warriors team are moving on. 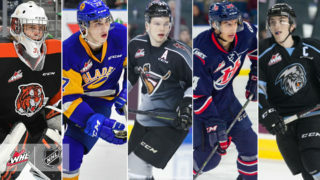 Brayden Burke, Jayden Halbgewachs and Tanner Jeannot are all graduating, while Brett Howden, Kale Clague, Oleg Sosunov and Dmitri Zaitsev aren’t expected to be back next season either, meaning the Warriors will lose 475 points from this year’s team. That will leave players like Almeida, Brook and Woo, among others, to carry the load going forward. All three learned a lot from the departing players and they will now get a chance to lead the team next season. “I’ll take that pressure,” said Almeida, who finished third on the team with 98 points this season. “I want to build on that season and next year I want it to be even better. Organizationally, the Warriors’ focus now turns to the WHL Awards and WHL Bantam Draft coming up next week in Red Deer.